Several months ago, I released my first book: By the Light of the Moon: 13 Simple & Affordable Pagan Spells & Rituals for a Year of Full Moon Celebrations. You've probably heard me mention it a time or fifteen, mostly because it's what allows me to keep the blog financially alive. At the time of the release, I had a post detailing the contents of the book along with a few sneak peek photos. But now the time has come, my friends. The time where I give you a sneak peek spell! Because, come on, what Pagan doesn't love themselves a good sneak peek spell? Without further delay, go to nature and get to casting, my witchy friend! When I was a child, I fantasized about having a wishing well in my backyard. Even the wooden wishing wells used as gardening accessories made me long for a well of my very own, convinced they were the gateway to a magickal realm just beyond my well-less grasp. Oh, how I yearned to be able to reach between the circular stone walls and draw my fingers across the mirror-like surface of the cool earth water, just like Snow White. Birds would gather ‘round, and we’d sing together and sew dresses and such. Yup, if I had me a well, life would be good! Of course, as a kid I also wished I was a pilgrim and a whale. I was a very strange little child. As an adult, I still desire a well, though it has a lot more to do with water bills than helpful chipmunks. Yet no witch can deny the mystical enticement of a well, especially the pretty ones with cool pails on a pulley. My inner child yearns to creep out on a moonlit night (dressed in a long velvet cloak, of course) to cast and conjure in the darkness, binding my spell by tossing pebbles into the water. I would listen carefully through the sound of rustling leaves and croaking frogs for the telltale splash that confirms my spell has begun, magick has been woven, my arcane wishes have been granted. So, my fair ladies and lads, I invite you to satisfy your own well wishes (did you see what I did there? Double entendres are fun!) with your own personal Full Moon Dream Drop Wishing Well. ★Using the marker, write an aspiration on each rock, preferably one or two words each. For example: Abundance, happiness, health, new job, healthy relationship, new home, etc. ★Fill the jar or bowl with water. Take the jar and your wishing stones outside or by a moonlit window. ★Sit quietly for a moment (preferably in the grass or soil) and center yourself. ★One by one, carefully drop each wishing stone into the jar as you envision the assigned word coming to fruition. For example, if you’re casting for happiness, picture all the simple pleasures that make you happy as you release the stone into the water. If you’re casting for health, imagine yourself in tip-top shape, stretching and moving without any pain or illness. Bring forth the visions I’ve conjured in sight. This spell has been cast, these wishes attained. ★Leave the jar outside overnight or on a moonlit windowsill. In the morning, pull the stones from the water and allow to dry. Return the water to the earth. If desired, you may keep your wishing stones with you until your spell manifests. Otherwise, place them in a safe place and know the Goddess has heard your moon wishes! I hope you enjoyed this sneak peek! If you're looking for more fun and magickal ways to celebrate the full moon, get your copy of By the Light of the Moon today! Do you have a favorite spell book? Sounds like something I can do! Thank you. Blessed Be! Found this spell as a 'pin' just now, which lead me to your blog/site, which lead me to your book.......I am a very olde one with years of practice and study behind me and after having a look at your book on Amazon I am delighted! It is so refreshing! I love your style, your rhymes, your spells and your obvious love of the Full Moonlight, a love which I share passionately with you! I will be buying your book at the beginning of next week! OAP here! This comes with gratitude for your obvious energy and love of what you do and what you are! Many thanks! The full moon is a beautiful thing, isn't it?! I sincerely hope you enjoy By the Light of the Moon! Since every purchase supports the blog, I appreciate your readership! 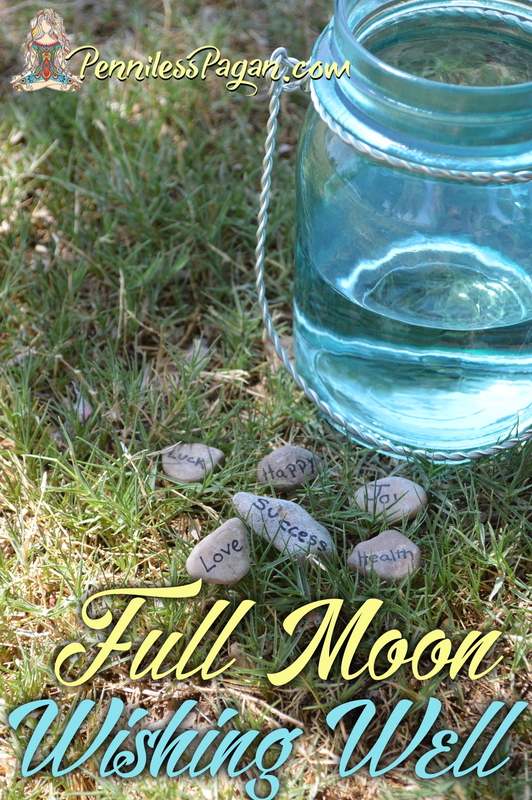 I have a large jar of full moon water from the first full moon in January of 2018. Is there something I can use it for before our Blue Moon, is it still usefull. Thank you. Thank you for this wonderful advice. Can I do it the next day after full moon? Hello! I'm new with everything so my knowledge is limit. This is my first time in this blog and I read the comment about the moon water, can the moon water be from the full moon of any time of the year or have to be specific? and can you recommend me something for beginners ? I'm not sure if all the information that I've been found is reliable. Thank you, and I'm going to try this full moon wishing spell. 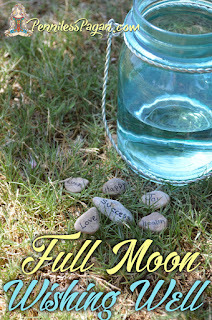 You can create full moon water any time of year (during a full moon, of course! =D). When you've completed a spell, you can dispose of the water in the garden or yard. Unless it's a banishing spell, then dispose of the water outside of your property. another question. Can I use the water on the yard afterwards? or is better if I leave it on the grass?